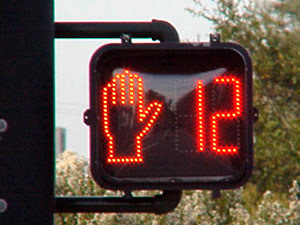 Where the Sidewalk Starts: Will Pedestrian Countdown Signals Suffer the Same Fate as Marked Crosswalks? Will Pedestrian Countdown Signals Suffer the Same Fate as Marked Crosswalks? "The data reveals starkly diﬀerent eﬀects for collisions involving pedestrians and those involving automobiles only. Although they reduce the number of pedestrians struck by automobiles, countdowns increased the number of collisions between automobiles. We show that countdowns cause fewer minor injuries among pedestrians for every pedestrian on the road and more rear ends among cars for every car on the road." Further, while the the countdown signals increase crashes overall, at the most dangerous intersections the installation of countdown signals reduced crashes and made the intersections safer. Neither of these statements is false, but they also don't tell the whole story about the effects of the signals. More importantly, if you're a policymaker faced with a decision about whether or not to install countdown signals, they could easily lead you to the wrong conclusion. "The ﬁndings imply authorities can improve welfare by sharing the information with pedestrians and hiding it from drivers. For example, rather than making countdowns visible, the traﬃc authority might announce the time until a light change through a speaker that only pedestrians can hear." "...cities might beneﬁt from installing countdowns at dangerous intersections and not at safe ones." It's easy to jump to conclusions about studies based on headlines, but decisions about infrastructure should be based on a more thorough evaluation of the evidence--particularly when pedestrian safety is at stake.